Function. The task of a federal grand jury is to decide whether probable cause exists to believe that a person or entity (referred to as “target” or “subject”) committed a federal offense. A grand jury proceeding can result in either indictment against a defendant or a “no-bill.” In case of a “no-bill,” the person will not be further prosecuted. Costello v. United States, 350 U.S. 359, 362 (1956). Definitions. The Criminal Resource Manual of the Department of Justice defines “targets and subjects” as follows: A “target” of a federal investigation “is a person as to whom the prosecutor or the grand jury has substantial evidence linking him or her to the commission of a crime and who, in the judgment of the prosecutor, is a putative defendant.” A “subject” of a federal investigation “is a person whose conduct is within the scope of the grand jury’s investigation.” USAM 9-11.151. If a company rather than an individual is the target of an investigation, the law does not consider officers and employees automatically targets themselves, even if the officer or employee’s conduct contributed to the alleged commission of the crime. Grand Jurors. Federal Criminal Procedure Rule 6(a) provides: “When the public interest so requires, the court must order that one or more grand juries be summoned.” Grand juries are impanelled in open court barring exceptional circumstances. Federal law requires that a grand jury shall consist of at least sixteen but no more than twenty-three grand jurors. Grand jurors are selected at random from a fair cross-section of the community in the district where the court convenes. It is required that a grand juror be a United States citizen, be at least eighteen years old, be proficient in the English language, not have a mental or physical infirmity and not be a felon or be facing felony charges. Grand jurors normally serve for eighteen months or less. Service usually requires meeting once or twice a month with fellow grand jurors at the location where the grand jury convenes (normally at the District Court or the local United States Attorney’s Office). Role of Prosecutor. The prosecutor has the authority to attend and lead the grand jury proceeding, 28 U.S.C. Sect 542 & 547 and Rule 6(d) Federal Rules of Criminal Procedure. The prosecutor’s role is to act as the grand jury’s legal advisor, to inform it about the law and to present evidence for the jurors’ consideration. Normally, the evidence presented at grand jury is either individual testimony or documents. Either way, the evidence presented to the grand jury should remain purely factual. Argument and supposition are impermissible at grand jury and it is inappropriate for any government witness or attorney to attempt to influence the grand jury process through these methods. Moreover, a prosecutor has an overarching duty to abide by the law and must not mislead a juror with evidence that the prosecutor reasonably believes was obtained illegally and thus is not admissible. One departure from standard admissibility rules is that hearsay evidence is generally admissible before a Grand Jury as long as it is presented as hearsay and not as first hand knowledge. United States v. Calandra, 414 U.S. 338 (1974). Prosecutors must disclose evidence to the Grand Jury that could directly negate the guilt of a subject of the investigation. USAM 9-11.223. Voluntary Testimony. Most people that testify in front of a grand jury do so after receiving a subpoena. The government will normally not force a target to testify in front of the grand jury. However, targets of investigations occasionally request to testify at grand jury proceedings. Although the prosecutor has no obligation to allow such testimony, it is common practice to permit such witnesses to testify. In such a case, the testifying targets waive their right against self-incrimination and they consent to a full examination under oath. Targets are informed that the Grand Jury is investigating whether or not a violation of federal law occurred, that they have a right to refuse to answer if answering the question truthfully may incriminate the target, that anything that will be said may be used in the Grand Jury and subsequent proceedings, and that a target has a right to consult with his or her attorney (“Advice of Rights”). An attorney for a testifying witness may not attend the grand jury proceeding. Normally, the attorney will wait outside the grand jury room. The attorney will be allowed to speak with the witness should the witness request to consult with his attorney during questioning. At this point the witness will step outside the grand jury room and consult with his attorney. This consultation is permissible and doing so does not adversely affect the witness. Subpoena. Subpoenas for grand jury proceedings are regulated by Rule 17 of the Federal Rules of Criminal Procedure. 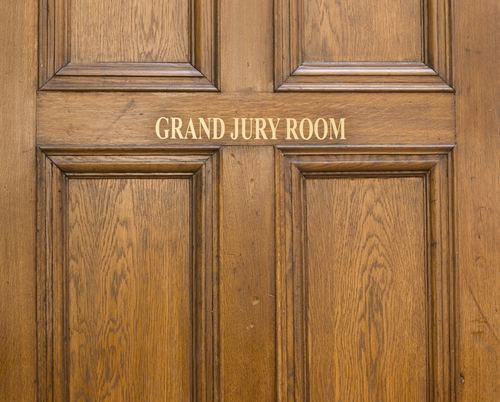 The purpose of a federal grand jury subpoena is to obtain evidence for presentation to a grand jury that may show that a person committed a federal crime. A grand jury’s power to issue subpoenas is extensive. In theory, a grand jury subpoena can be directed to any person/entity and require both testimony and the production of anything. In general, the only protection against a grand jury subpoena is the Constitution, the common-law or statutory privilege. Constitutional issues may arise when subpoenas are overbroad. Subpoenas must be reasonable in scope in order to conform with the Fourth Amendment requirements. Privileges such as the marital privilege and the attorney client privilege are respected in the grand jury process and are not eliminated simply because a subpoena is issued by the government. Later Proceedings. The government cannot use the subpoena power of the grand jury to further the investigation of a case after indictment. That being said, it is not uncommon for new cases to arise from a shared set of facts from an indicted matter. Under this set of circumstances, a grand jury may convene to explore facts that may give rise to a separate criminal charge. For example, if it turns out that additional defendants exist or that the indicted individual committed more crimes than originally known, the grand jury may return. In re Grand Jury Proceedings, 586 F.2d 724 (9th Cir. 1978). Note that even if the grand jury issues the indictment, it is important to remember that the grand jury does not decide guilt or innocence. The sole function of the grand jury is to determine whether probable cause for the commission of a federal crime exists. United States v. Calandra, 414 U.S. 338, 343 (1974). Call us with your questions.